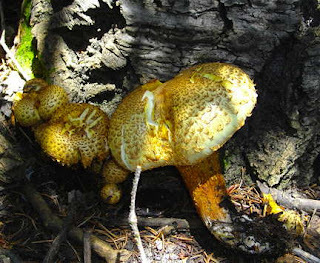 I think this is Pholiota squarrosa, "Scaly Pholiota"
My Colorado and New Mexico blogging compadres are all talking mushrooms. This is turning into one of the years that we will remember. M. and I returned to the mountain-that-shall-not-be-named today. On the way up there, we saw a woman standing by the side of the Forest Service road, holding a suspiciously lumpy cloth grocery bag. Damn, the word is getting out. Higher up, we met a family of woodcutters—no problem there—but also this old guy coming hurridly out the one-lane road in a van, who did not meet my eye—suspicious behavior! Someone had been there—many of the hawkswing mushrooms that we had passed by last Friday were now gone. On the other hand, we found a bunch of king boletes popping up. In fact, we got more than last week. M. spotted some clusters of the pictured mushroom at the base of an old, dead aspen tree, surrounded by little firs. They were enough like hawkswing mushrooms to make me look twice, although the presence of gills instead of spore tubes meant that they were not. Personally, I think that "Scaly Pholiota" sounds like some greasy guy sitting behind an earthenware mug of sour wine in a Lindsey Davis mystery. Labels: mushrooms, summer, Wet Mtns.